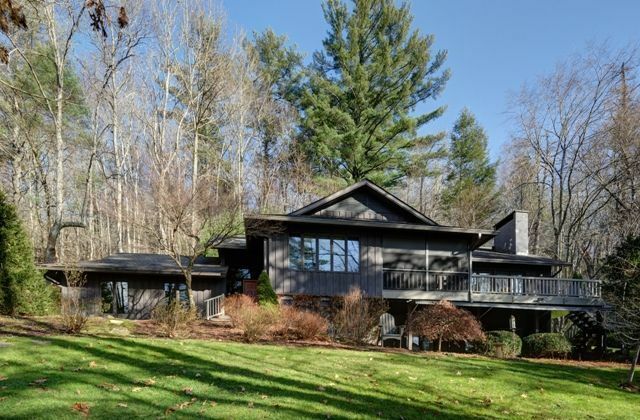 This Highlands home for sale on Spruce Lane offers a wonderful mountain contemporary style in a lovely setting. The National Forest borders two sides of this Highlands Falls Country Club home. In addition, the locate offers an easy walk to the clubhouse and the tennis center. If you have been looking for a private setting close to amenities this Highlands NC property is a must-see for your list. This Highlands NC home has 3 bedrooms and 3 bathrooms on a lot that is .61 of an acre. Inside the home is attention to detail at every turn. The great room boasts a massive stone fireplace and windows that embrace the views. The beamed vaulted ceilings allow the light to pervade the space. The master bedroom is on the main level, as is one of the other bedrooms. The lower level is home to the third bedroom, a private bedroom suite, as well as a family room. The property surrounding the home is beautifully landscaped and outdoor entertaining or relaxing is available on the screened porch and the open deck. The Highlands Falls Country Club has a great deal to offer residents. The 18-hole Joe Lee designed golf course is a stunner, a favorite of the area. Whether you are a golfer, a tennis player, or simply love the opportunity to be social in the clubhouse you will not be disappointed. Contact our team at Berkshire Hathaway HomeServices Meadows Mountain Realty today to schedule a private showing of 451 Spruce Lane. We welcome the opportunity to help you complete a successful Highlands property search. Let our knowledge and experience serve as your guide to finding the ideal Highlands home for sale for you and your family.